People support what they have a hand in creating, while a future designed by a few creates unnecessary resistance. 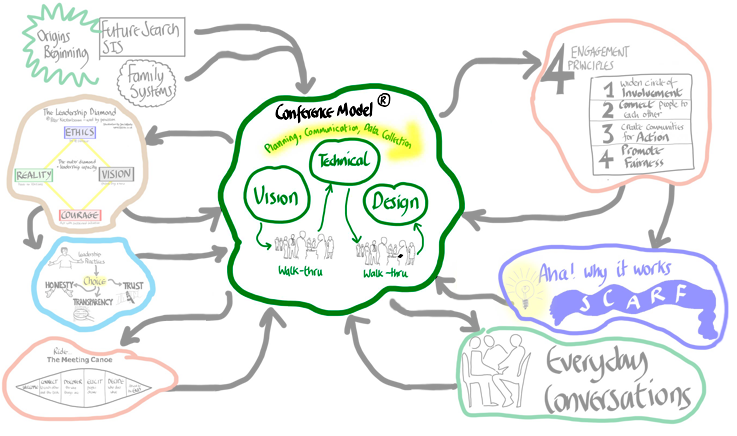 Our Conference Model® approach to organizational design involves internal and external stakeholders in a series of integrated conferences and walkthrus from the beginning. Conferences create an open exchange of information, increased understanding of the system under consideration, new agreements and actions, and enhanced relationships among participants. In these workshop-type sessions, participants at all levels create an organization that is productive and worthy of pride. Our introductory workshop is the place to learn the upsides and downsides of the Conference Model process and if it is the right fit for your organization. In this workshop we train your internal resources in each element of The Conference Model from beginning to end. Our consultants provide support following the workshop. We consult with you and your change team as we co-create a Conference Model process for your organization. We provide training, coaching, consultation, design and facilitation to assist you in achieving your goals.